Matt Nelson got an early start in vintage comics. His eyes were opened once he saw his first Overstreet Price Guide sitting on a friend's shelf at home. After reading it cover to cover, he was hooked. For his 14th birthday, his Mother bought him his first Silver Age comic, an Iron Man #1. "Of course I had to literally hand her the Robert Crestohl catalog and point to which comic I wanted. But boy was I excited when it came in." Matt's passion grew considerably over the next five years, as he networked with as many local stores and collectors as he could find in his hometown of Slidell, La and nearby New Orleans. He met Bill Ponseti in 1990, and helped Bill open More Fun Comics in late 1992. "It was the perfect job for me during college. We both loved Golden Age comics, and it was our goal to pump as much of it into New Orleans as possible, since the existing market there was very small." 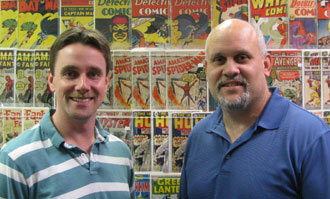 During the next four years, Matt and Bill became Overstreet advisors, began travelling to San Diego Comic Con, and basically accomplished their goal of establishing More Fun Comics as the Mecca of vintage comics throughout the Gulf states. The watershed moment came when an elderly lady walked into the store in January of 1996 with Action #1-18 for sale. She had found them cleaning out her husband's house on St. Charles, just around the corner from the store! The lady had visited a rival store first, but the owner, realizing he could never afford the comics, sent her to More Fun. In 1996 Matt had a chance to study restoration under Bill Sarrill, who is considered the father of comic restoration in the industry. Shortly thereafter Matt established Classic Conservations to offer his restoration abilities to collectors. Later changed to Classics Incorporated, the business now offers a myriad of services, such as restoration, pressing, proscreen, expert advice on third party grading, and investment consulting. Pedigreed comics held a particular fascination with Matt throughout all of this. His first exposure was a small entry in an old 1982 Overstreet Price Guide describing the Mile High collection. "I had just enough knowledge of Golden Age at the time, but not enough experience for that paragraph to create a sensational image in my head." It would be another few years before Matt actually laid eyes on the real thing, even after seeing Ernie Gerber's Photo-Journals. "It was bad enough never being able to see these mythic books, but wow, after reading Ernie's books and seeing those thousands of Mile High pictures…it became a holy crusade." After writing an article for Comic Book Marketplace #32 on sixteen famous pedigree collections, and receiving a favorable response, Matt thought an entire book on pedigrees was a viable concept. He began compiling as much information as he could find, including old dealer catalogs, original pedigree lists, and a full run of TBG and CBG, a weekly comic newspaper where most pedigreed collections debuted during the '70's and '80s. He eventually crossed paths with Stephen Ritter, and a collaboration was decided upon. "Stephen's information gathering is top-notch. He's an animal. Our vision of the book expanded tenfold when we teamed up and began sharing ideas." Mark Haspel and West Stephan from CGC also joined the team, bringing with them their own unique knowledge and experience in pedigrees. "West has extensively collected these books for years, and Mark is CGC's foremost expert on pedigrees. Their exposure to the thousands of pedigreed comics that have gone through CGC will give the book an unquestionable level of authority." Stephen Ritter has been collecting comics since the early 1970s and became a part-time dealer, selling at conventions and on-line over 15 years ago. He still considers himself primarily a collector with part-time dealer activities. He began collecting high grade Silver Age Marvel and DC and then migrated to Golden Age in the mid-1980s after completing most Silver Age runs. He can be found set up at most major conventions around the country, buying and selling comics. In his real life, Stephen is a Lt Colonel in the US Air Force which moves him all over the country every 3 or so years. He is currently stationed in Ohio. His fascination with pedigreed comics came from an early 1980s interaction with Chuck Rozanski and the Mile High Collection. "Knowing the history of the comic, where they came from, how they were saved and stored over the decades has always heightened my interest in a comic." He possesses several thousand pedigrees from the Golden to the Bronze Age, and is always buying books from new pedigrees surfacing. Stephen has been keeping a pedigree database for almost two decades. It was the building of this database that led him to pursue documenting pedigrees in a book format, and joining up with a team of pedigree experts with the same goal in mind. "I am very fortunate to be working with Matt, Mark, and West, who's unsurpassed knowledge on pedigrees will help make this book happen."